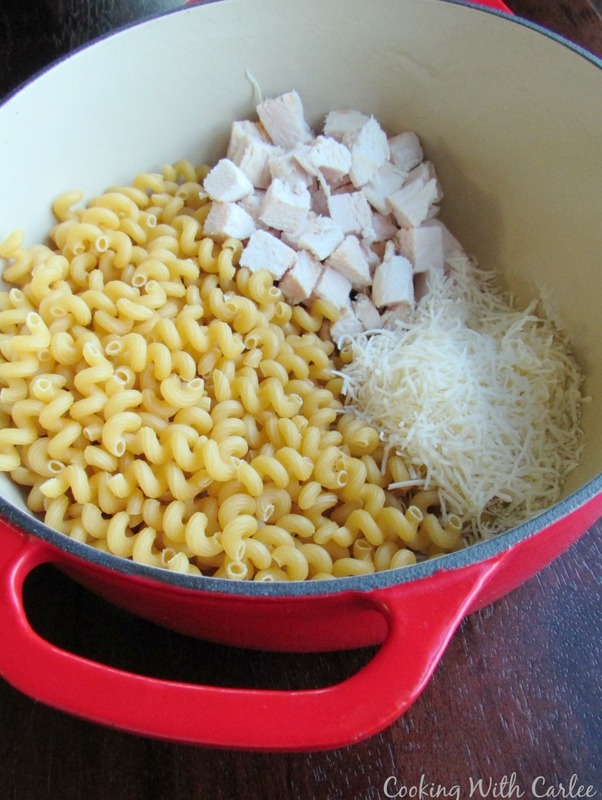 This complete dinner comes together in one pot in under a half hour! 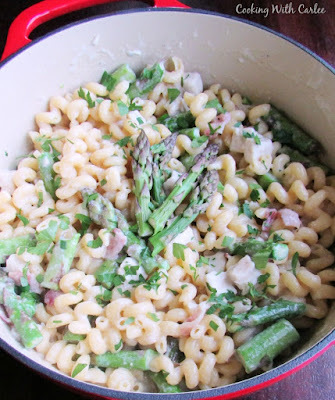 Chicken, bacon, and asparagus in a creamy pasta with almost no dishes to do! I have been intrigued by this one pot pasta craze for a while now. I mean, what is not to love? A whole dinner made in one pot with almost no effort is something that has to have your attention. Then the folks at work were talking about a couple of the recipes they love and I just couldn't wait any longer. I had to jump on the bandwagon. I always have a selection of pasta in the pantry. I can't help but to stock up when I see it on sale. I know I will use it and all of the fun shapes draw me in every time. So I knew I had that covered. My cheese drawer is almost always full too, so that wouldn't be an issue. That is a pretty good start towards a delicious dinner. You know by now I am not one to run to the store just to make a recipe. I am WAY more likely to dig through what I have at home and make something with that. So I put my hands on some leftover chicken. If you don't happen to have any leftover, feel free to grab a rotisserie chicken or quickly cook off a couple of chicken breasts. Whatever is easiest for you works here! I had a few bunches of asparagus waiting to be made into something delicious as well. 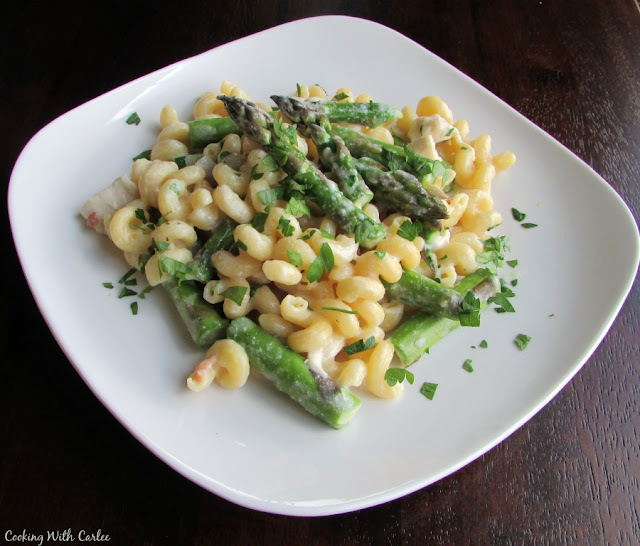 I have been really loving experimenting with asparagus lately. Asparagus salads are one of my new favorite things. If you haven't tried one yet, I highly recommend my ABC Salad or Maple Bacon Asparagus Salad. These spears were destined for the pot though. I have to say this particular bunch of asparagus might have been the biggest stalks I have ever seen. You might think they would be a little bit woody, but they weren't at all. They were tender, delicious and ginormous! Of course a little bacon can add a lot of flavor to any dish so I grabbed a few slices of that and got to work. The premise of a one pot meal is to keep it as simple as possible and this fits the bill. Just cook the pasta in a mixture of broth and milk. The starch that you would normally pour off stays in the pot and helps make a sauce. It saves you from having to make a roux. A little cheese helps thicken everything up and adds that great flavor. A lot of recipes have you put everything in at once. That would certainly be fine here too. But I wanted my asparagus to still have a tad bit of crunch left and I wanted my bacon to still be crispy. So I added them a little later in the process. Feel free to do what you'd like with yours, I'll never know! The best part about recipes like this is they are so adaptable. As long as you get your pasta to liquic ratio right, you can change up the rest. So you can experiment with different stir-ins if your refrigerator happens to be full of a different variety of proteins and vegetables. If you make something stellar, I'd love to hear about it! 1. In a large pot, preferably one with a thick bottom like a dutch oven, place the chicken, pasta, chicken broth and milk. Bring to a boil over medium heat, stirring frequently. 2. Reduce heat to medium low and cover the pot. Cook for 10 minutes, stirring occasionally. 3. Stir in the asparagus and cook for another 5-10 minutes. You want the pasta and asparagus to be cooked to your liking. 4. Remove from heat and stir in bacon and cheese. Season to your liking and serve. I'm so excited..another unique and easy asparagus dish!! And with bacon.......Bring it' girl!!! Wishing you a very happy Monday!!! You know I have to put a little bacon in there! Thanks, Andrea! Hi Carlee, my family LOVES pasta. This looks like a great dish to make and thanks for the recipe! I've never done the one pot pasta thing, but this looks divine. I love the asparagus in there :). Happy Monday, Carlee! Yummy! I love asparagus and bacon! The two together sounds divine! Trying this for dinner! They are meant to be together for sure! I hope you love it! Exactly, with all the good stuff in there! Hi Carlee, one pot meals are so handy. I like the taste bacon adds to a dish like this and like the fact that there is no need to make a roux, but there is still a nice sauce. Another winning recipe! Thanks Debbie! Quick, easy and bacon tend to be winning words around here and this fits the bill on all three! Triple win! Carlee, this looks so good! I will definitely try it so I'm pinning it for later!! Mmmm... This sounds so good! 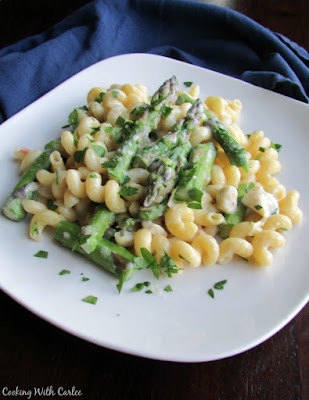 Hope I can find some asparagus at the farmers market this weekend and give this a whirl! It was delicious and so easy! Fingers crossed!